Hai Dung Nguyen was introduced to us by Lisa, and did incredible work first assembling Gemscales, and later in charge of repairs. Later she brought her sister Trinh to join us as well. 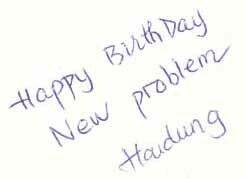 I loved this greeting Hai Dung left me on a birthday card once.